Call our sales : +6281283804273, wa : +6281932632003 for price about Extech 407119 hot wire airflow meter in jakarta. The extech 407119 hot wire airflow meter includes a min/max display and a 20-point averaging feature. careful use of this meter will provide years of reliable service. 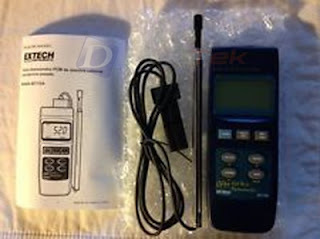 the extech 407119 utilizes a telescoping antenna with built-in air velocity and temperature measurement transducers. cfm ( cubic feet per minute) measurements are displayed after manually entering the area of the duct and then taking an air velocity measurement.